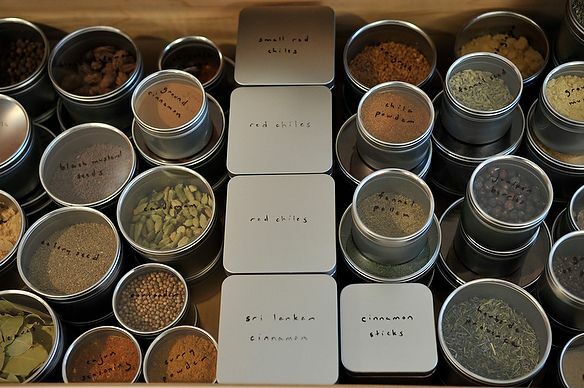 Last fall, I wrote about how I organize my spice drawers. Many of you contributed your own methods for storing spices, and weighed in on my approach. Some rightfully pointed out that plastic containers were not the ideal receptacle. Fair enough. It took me 6 months but I got rid of them. Thought you’d like to see my new spice tins! Yes, their tops are clear plastic, but this allows me to see what’s inside, and their bases are lightweight tin. Hi, Amanda. I ordered a couple dozen tins with the transparent tops, from your source. But they are not air tight. Does this make your spices go stale faster? Does it bother you at all? Wow for years I have wanted to do this, and had purchased a set of these off Amazon, but thanks to your post I cancelled that and went to specialty bottle for twice as many clear top tins at about 3/4 of the Amazon cost and they will be here sooner., I am going to put magnets on the bottom and stick them to the side of the fridge and I ordered round clear spice name labels for the tops too for 7.00 at amazon. I can't wait to get my hands on them, no more spice jars falling out of the cupboard, that I am sure a man designed!! Beautiful tins! I keep my most "changeable" spices in the fridge (Aleppo and Cayenne peppers, chile powder, sesame seeds). Helps to keep the color and flavor. But you have quicker turnover than I do! That's smart. Would love to have a spice fridge! Baby food jars..........easy to open, see right through them, no leeching of chemicals like plastic, and won't dent like thin tin does. I have recently converted my spices to glass and stainless containers, similar to these, but this is the first time I have seen ones with clear tops. I LOVE the idea of being able to see the contents within! Thanks for the link to the shop! Cool idea -- but not sure I could live without temper tantrums! Mostly 4 and 8 ounce containers, with a few 16 ounce ones for larger spices. I also bought the large tea tins for things like chilies. Amanda, Did you get the containers marked "clear top cover" or "twist top tin"? I ordered some square ones from here months ago that are very difficult to open; maybe the twist top is key? Clear top cover -- and mine are easy to open. But I also bought a twist top one (to see) and it opens and closes well. How easily do the lids come off these tins? I'm missing your grains of paradise amanda :-) - I love the tins! They're in there somewhere. Thanks! About six months ago, I switched all of my spices to plastic jars after seeing Amanda's photo and post. I have way too many of these little plastic jars now, but will eventually switch to the tin ones, although they look like they take up more space. I only have one, narrow drawer to give up to spice storage. So sorry Phyllis! But you know what? I saved all my plastic containers for leftovers and such. They also work well for things like screws, nails, picture hooks, etc. Is it easy to remove the lids. I have some little tins that are difficult to open. My spices are currently in plastic (also from the Dr's office), labeled, and arranged alpahbetically in two drawers. I love it, but have thought about switching to tin if the lids come off easily. I was reluctant to switch to tins for the same reason, but in fact these tops are really easy to remove (some are a little too easy). You could cover the writing with clear tape to protect it. Alternately, most label makers have clear tapes available. I use white labels because they're easier to read in my dark cabinets, but I think if I had my spices in a drawer, the clear would look nicer. MWD, I really like your system . . . What label maker do you use? I need one! I don't have enough drawer space to accomodate a set-up like Amanda's, so I have a small, two-story Lazy Susan in a cabinet at arm's reach for seasonings, herbs and spices I use all the time. The rest are in my pantry, a few steps away. I estimate that Amanda's spice drawers would comprise more than 50% of the drawer space I have, total, in my tiny "maid's kitchen." Fortunately, I have a companion "butler's pantry" with a stand-up work table, so I can't complain. A lovely solution, and so pretty, too! My spices are over my stove -- the ultimate no-no, and they are too high for me to reach on my own, so I either need a chair or my husband to nab them for me. And I have no fabulous containers. Sigh. Thank you -- someone emailed me a photo of a magnetic wall they had with all of their spice jars attached to it. Maybe that approach is in your future? These are really beautiful! But my fear of Alzheimer's (which was my mom's fate) keeps me away from anything aluminum. Oh no -- I didn't even think of that. What a great web site. This is even better than The Container Store!!! I want one of everything on here. If I redo my spices, will you come write all the labels? Your handwriting is so tidy. What pen do you use to keep it from smearing? 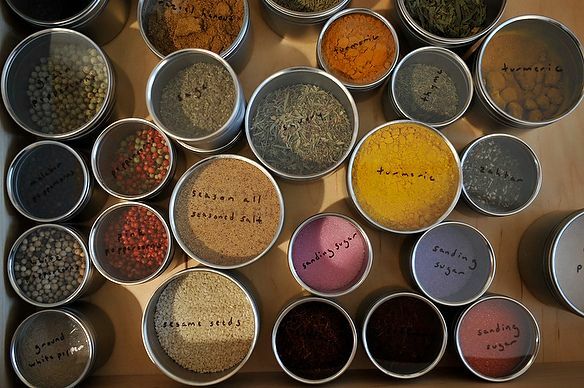 This is very motovating - I need to go through my spices and get rid of some old stuff - these tins will save everything from ending up smelling like Vietnamese cinnamon too ... I think I will order some - thanks for this!! When we went through my spices, transferring them from plastic container to tin, it was amazing to see the age difference of some of the spices. I had turmeric in three different colors (it gets darker as it ages).